I had seen these cupcakes done before online, but hadn’t had a chance to try them until a friend asked me to make them for her son’s birthday. They sure were fun to make, and from what I heard, fun to eat as well. 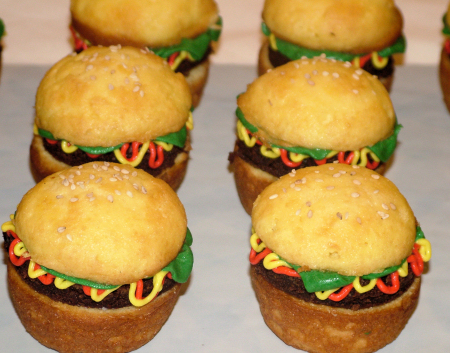 😉 They are yellow cupcakes with a brownie “burger” and icing for condiments. Made this today for labor day and my FIL’s bday. 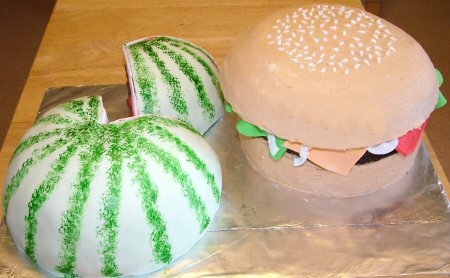 All cake except “beef” part is brownies…cheese/lettuce/tomato/onion are fondant. 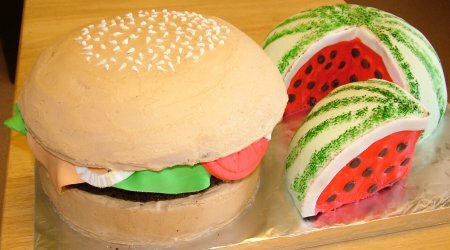 Watermelon is chocolate cake covered in fondant!